All cabinet components slide together without force or effort because of Slide-Lok’s patented Dovetail assembly system. Assembling your Slide-Lok garage cabinets is quick and easy. Click here to watch Bob Vila's segment on assemblying and installing our cabinets! If you should decide to assemble your Slide-Lok Garage Cabinets yourself, each Slide-Lok garage storage solution comes with the hardware needed for assembly and installation and is accompanied by detailed assembly instructions. The Slide-Lok garage storage solution is easy to assemble and install because of our patented Dovetail assembly system. All components slide together without force or effort. Please read the enclosed directions a few times. All the cabinets assemble in the same order. When applying glue to the edges, it is a good idea to leave about four inches of unglued material so that when you slide the pieces together the glue does not "glob out". Glue ALL joints, as the video shows them gluing one only and forgetting the others. When installing the interior corner braces, I have found it best to attach the brace to the side first, and then the face frame. BE CAREFULL when you screw them in, as too much pressure can create a gap between the side and the face frame. If you notice a gap has been created, simply unscrew the corner brace and re do in a slightly different position. If you have a brad nail gun, use one inch 18 gauge wire brads to tack the sides to the face frame, and to tack the sides to the top and bottoms, and to tack the nailing rails to the sides and top and bottom. If you are not nailing, put the cabinet in a level place and allow glue to dry. 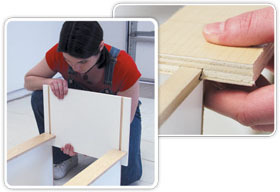 Make sure the cabinet is square and the joints are all secure before letting the glue dry. 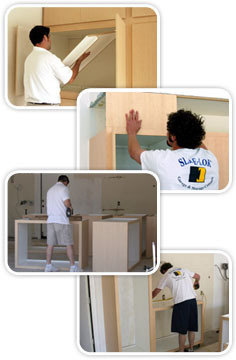 After the cabinets are dry, use installation tips to attach cabinets to the wall. Put the shelves in before putting the doors on. You can do them after but access is easier now. When locating the shelves, put a screw into the center of the clip and into the sides of the cabinet, then after positioning the shelf, secure the shelf but screwing up through the bottom of the clip into the shelve. Be sure to push in on the sides of the rear of the cabinets when securing the shelf, as this will help add rigidity to the cabinet. Add doors; add bumpers in the extreme corners of the doors (they must bump against the face plate). Adjust doors to be level, even and adjust the gap in the middle. Now shim the rear of the cabinets if necessary to insure that the doors will remain closing properly when the cabinet is screwed permanently to the wall studs. If the walls are out of plumb, you will notice the doors don't quite close properly unless shimmed. Build all cabinets for "section" you are ready to install. higher than the top edge of the rear of the cabinet. If anything, leave a 1/8 inch margin. stackable cabinet you put on top will not sit flush on the bottom cabinet. Leave the doors off and shelves out for now. using a level make sure the very bottom of the front of the cabinet is perfectly level. only secure the bottom of the cabinet to the wall, and have it level in all directions. tighten until the face frames butts together, don't over do it. Now screw the bottom of this cabinet to the wall making sure it is level front to back. get a smooth uniform look. to get all the face frames flush and smooth.